I haven't posted there since the beginning of my live system project, since it was only available in French. But lilsirecho was so enthusiastic about it that I finally released it in English/French ! That means nothing is launched without you requesting it, and that I always try to launch as few processes as possible. It doesn't use much RAM, here is a screenshot with desktop/web browser/filemanager using 43MiB RAM. So when I say lightweight I really mean it. All included apps (see documentation for details) are indispensable. Everything you can't live without should be there : web, ftp, email, chat filemanager&archiver, office, image, audio/video reading and editing and CD burning. In the 0.5 version, an experimental GIT version of nouveau was included, which allowed me tu run smooth 3D on most nVidia cards ! All possible drivers for video are included (with scripts to set them up if needed) ; the goal is to support the most possible machines out of the box. As it is for sound. Now, I use nouveau from the repos, as I do for the rest of the system : I want to keep in touch with Arch, using the best possible the repos, for updates to go the best possible when the system is installed. The last bleeding-edge function is the clean BTRFS support, for the persistent home, and at installation and after. Then, to be able to modify the whole system as much as you want, there is the "add-on" support. And of course you can install it on a PC at any time, with any combination of the base-system/addons/personal-home ! I'll add I'm very fond of fancy boots and desktops, so I think this live system (and resulting installation) give a good example of how I think an Arch install should look like. I'm open to suggestions by the way, if they can get along with my idea. Otherwise, make an addon and everyone will be happy ! x86_64 version is just released and available for download ! Downloaded and installed 0.6-x64.iso into a 16GB adata 533x CF card, mounted in cf2sata adapter. Successfuly reached desktop with english option in 13 secs. Rebooted and selected copy to ram at prompt. This reached desktop in 23 seconds. System performance is snappy ...includes jumanji. Performed an install of vlc with pacman (removed the forced repo..arm) and it performed flawlessly. Added a 2GB partition to the CF card for addons and copied previous system addons(64bit) to the CF card 2GB partition. This enabled internet for the vlc download above. There is also an i686 version available. Kudos to Calimero for this fine .iso. Thanks, will give it a go!! Edit: tried it on an 6 old pc and works like a charm. Some small things that could be adressed I will post about later. Performed a test on x86_64 system, which in my system, is provided via CF2Sata adapter and 533x adata 16GB CF card(s). I booted one CF card with x86_64 installed along with eight addons provideing such packages as feh, mirage, kdenlive, HP printer and vlc. This card performs @45MB/sec in this man's machine loading to desktop in 13 secs (~550MB assumed). While booted into CTK, and having a second CF device inserted inanother CF2Sata adapter, I used dd to write the installed CTK program to the new CF card. This proceeded at a rapid pace and took ~ eight minutes to load the 16GB CF card. That means the transfer speed in write mode was 2000MB/min(2GB/min) which is ~33MB/sec. The program thusly transferred performed well in boot up in CTKArchlive. All addons performed as expected. Typical boot time to desktop is 13 seconds and in copy to ram 23 secs. The CF cards a partitioned with first partiition having the .iso program and the remaining space (~15GB was partitioned as CTKhome (much more than enough!). Lazy man's partitioning!!! As I have other CF cards , 8GB patriot 266x, I tried the .iso in those CF cards. They did not boot with either i686 .iso or x86_64 .iso installed per dd. Thus, not all CF cards are good performers.! Interestingly, the file system in the CTKpartition is UDF which may be the reason for the failing CF cards. Just a note for any interested user(s) showing the excellent performance of the "live" arch application by Calimero...rapid load, persistent, and copy to ram. In copy to ram, the mobo reset button is instant reboot! Pacman, arora, midori,jumanji, openbox, smplayer, vlc ,kdenlive,HPprinter, feh , mirage,gimp,avidemux and more to come! EDIT: Running the CF in USB mode causes a ten minute boot time..
Just for fun, I started to port this liveCD on Arch Hurd ! It's not stable nor finished yet, it's just a preview. How does this compare to Archbang? Archbang uses a lot of stuff from this liveCD (gtk theme, some scripts). I tried to suggest some improvements to them when they were still on this forum, but I think that their team methods from the very beginning may have been the cause of some difficulties. If you want to compare, I would say the main difference is that archbang tries to do everything at once, where I prefer to ensure the provided features work well. 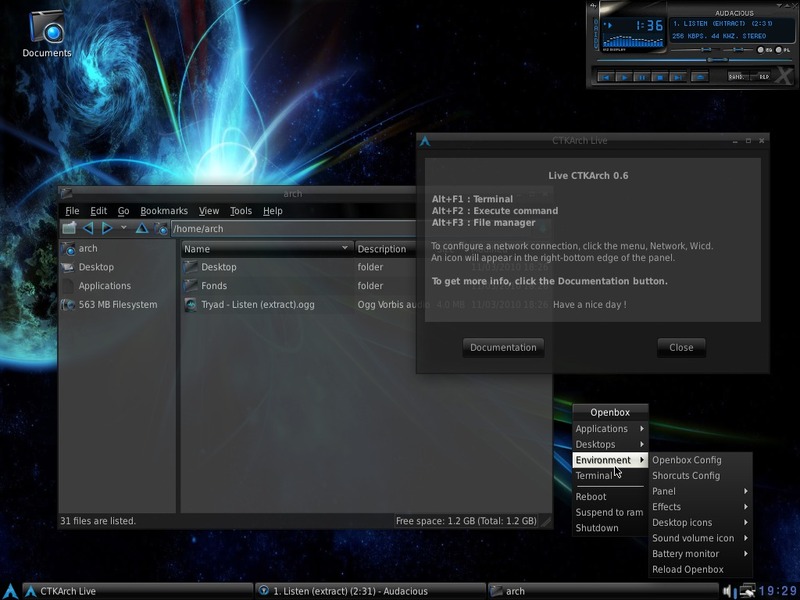 The addons system aims to provide a nice customized live system, too. I really like to give users the choice when there really is one to do. The real answer is... try both, and see by yourself ! Yep, I forgot to say for Mr Green, that I wanted to contribute to archbang at first, but they refused to include the (free open source !) video drivers. In my livecd they are fully integrated. They said it would be "heavy" to include them ; but I measured it would only add 3.8MiB to the ISO ! There only is vesa and they instruct the user to install the right driver by himself... This makes very slower the test of the support of a video card under Arch, and needs an internet connection for that ! Yes, there is a clash between me and them because we make different choices, but I'm so sorry about that... for the overall goal is similar. Oh, and I forgot to say : to add software/stuff to the ISO image itself before burning it (that is, the "addons", that are squashfs archives) you can use the excellent software isomaster is. I will certainly try Ctkarch out, Archbang does boot really fast and has some nice features. Quick question does ctkarch has a password for root/sudo, network did not set up at boot want to run wicd? The passwords are : arch for the arch account (and for yaourt) ; toor for root. They are indicated in the tty1 too. …and in the documentation, which is gently offered for reading at bootup. But if you were used to systems with annoying popups everywhere, get prepared for changes. II forgot to say it clearly in my first presentation post, but one of the base principles of this system is to never launch something by default that someone may not need. There are no annoying popups, no apps launched by default apart from the desktop, no automount of removable storage media, etc. Maybe this looks a few radical, but I really enjoy to see what refusing compromises like this can lead to ! Got net working after launching wicd... any reason why it is not started from boot? Happy to see you in CTK! I'll just quote the message previous to yours. Maybe you should have paid a little more attention to it. It feels like it's definitely not your kind to read before asking. When I choose Clavier Anglais (not in English) I still get a French menu. Both from the bottom bar and the Openbox context menu. The language setting still is French in short(when installing, edit the etc/locale.gen file and use locale-gen to change that). There is no conky on the desktop; what a brave guy you are, Calimero, to leave that out. I think it is a good idea for old pc to use Arora, but to make it the default browser is aiming/limiting this distro at a certain segment, which I would say, no; but of course choices like that are to the dev. Midori has crashed so much in the past that I don't even want to try it anymore. In Arora the default search engine is Yahoo; didn't even know it existed anymore. I think in any browser that is in the spirit of FSF Duckduckgo should be the default; and it gives much better search results. In Openbox configuration I miss the themes I like the most, but that is of course also very personal. The icon theme is Azenis. The default look is a bit like modern black scheme a few years ago. This is totally unimportant of course but in this field, the look and feel the distro can make major improvements, look for instance at ADComp wonderful openbox configurations in Madbox 9.04 or 10.04. LxAppearance and Obconfig for configuration of openbox but not Obmenu. I also miss the wonderful Adeskbar, a beauty of a little, lightweight dock. Then you can leave out fbpanel. Similarly the rc.xml file is totally basic; no keybindings to programs at all. So in the openbox department there are a lot ofconfiguration choices left open. A bit too much to my liking. The fact you have to start wicd by hand at each live session, is understandable as a theoretical point of view, but just not practical; I think you should compromise here. Testing my webcam with mplayer tv:// worked well with a Logitech Quickcam Communicate STX. In the application choice apart from webbrowser I find little problems; I like pcmanfm. Other Reseau/network programs pidgin, sylpheed, xchat, gftp. Gpicview (not listed in the ob contextmenu) wouldn't be my first choice. I prefer Ristretto which is also very lightweight. Gtkam to get pic from you camera and Gimp. Audacious, Avidemux, smplayer, brasero, mhWaveEdit for video and music. Did you choose English at bootup ? I tried it myself several times, when you choose it, everything is in English including the installed system ! Is the welcome popup window in English ? This info would help me finding out what's wrong. Addons solve all decision conflicts ! And include it inside the ISO image before burning it with the amazing software isomaster is. Just copy the addon into the addons folder of the iso image, save the modified iso and burn it. Noted for the search engine, thanks. obmenu is already noted for inclusion for the next release. I'll have a look at adeskbar and the configs you pointed out, they may give me interesting ideas ! Ristretto has a big part of XFCE (thunar, xfce libs) as dependencies, so hopelessly I can't include it. I try to keep the iso image "small" ! Hi , Calimero, thanks again for your efforts and kind answers to my suggestions and questions. I now understand what went wrong. I have a very good monitor HL LP2475w which I can recommend to everyone; the colours and quality of moving pictures is awesome. The only drawback that is has some latency starting up. In your start menu you have an auto choice option in which the French one is the first, so I saw the second screen only after autochoice for French and didn't know better this was the first one. This explains the problem I had. Will be following your progression with CTK. Did a post on the Archbang forum on you distro. Thank you for providing an add on for Wicd. Indeed the procedure with isomaster is amazingly simple. Now I only have to learn how to make an add on myself. I found this info: To create an add-on to contain packages/files or more simply the changes you did to the live system since its bootup, run "xsu /addons/mkaddon"
This does not explain for me how I make specific addon linked to specific applications or openbox setup with new themes etc. Could you provide more info on this? anyone try to install? grub install error here. Perhaps my method os employing addons/mkaddon will answer your question. This enables the mkaddon program. You may at this time select the install all changes "y"...or answer "n"
The next step allows pacman to download specific packages to place in the addon.... you may skip that step if desiring to perform other activities in the addon...If this step is implemented, the addon is auto-added to /media/CTKHome/addons. The steps to perform in establishing the use of the addon, such as..ask or no-ask and mksquashfs are auto-provided and result in an addon with sqfs extension. Then the /tmp/root addon(sqfs extension) can be copied to to the addons in /media/CTKhome addons.. This is only needed for addons created in /tmp/root.